The “ego” loves to be pandered to and adored. There is nothing wrong with this … everything has it’s time and place. 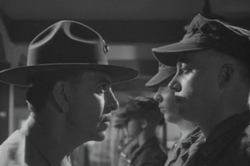 However, everyone could use a Drill Instructor from time to time (or constantly) because in a sense the DI is the “ego” (who we *think* we are in this world)’s worst nightmare and the “True Self” (that which cannot be thought)’s best Friend. The reason The D.I. is not “your” friend is because you cannot predict what The D.I. will do. The D.I. is the Best Friend to the Self because The D.I. can predict what you do in a flash, in fact, usually The D.I. sees what you will do ten moves ahead of where you are at. The D.I.’s job is to break you of who you think you are. You may want to fight The D.I. but you know even when you do it, you don’t really want to win. You want to lose yourself and yet at the same time are afraid of the unknown. Who you *think* you are is like a “woobie” blanket that you had as a child … it couldn’t really protect you from anything but it sure felt like it could. That is what the “ego/who you *think* you are” is … it is a blanket/skin that is wrapped around “Nothing” to make it seem like you are protected from something, but even the *something* that one thinks they are protected from … is in Nothing. Not “nothing” like blank … Nothing like “No Thing.” This means that in a sense there is something there but it is nothing that you can use the senses for to understand. The “ego/ who you *think* you are” attempts to understand everything, yet it is The D.I. 's job to remove what you have come to understand and leave you empty(ier) of who you think you are. You hear people all the time say … I am a smoker … I am a drinker … I am a vegetarian … I am a meat eater … I am a man … I am a woman … I am an alcoholic … I am a drug addict … I am a home maker … I am white … I am black … I am Native American … I am Indian … I am Chinese … I am Christian … I am buddhist … I am atheist … I am a husband … I am a wife … I am a sister … I am a brother … I am a department store clerk … I am a musician … I am a writer … I am a poet … I am an astronaut … I am an inventor … I am human … I am (insert name here). Yet you … the True You … are none of those things. All of that is Secondary to who you Truly Are. This one is lucky it actually has a Drill Sergeant as a Teacher. Not Lucky for “me” just Lucky. This doesn’t mean that everyone should go join the Military … though it’s a start. When the Student is Ready … the Teacher will appear. How will you know the Teacher has appeared … the Teacher will not pander to you. You won’t always get what you want but you will get exactly what you need. Want an Asskicking? Click Here.